Paper cone belongs to industrial paper type which is used in textile industry. It is a kind of thin vulcanized fiber paper. With the feature of high toughness, high wear-resistance, smooth surface and good water resistance. 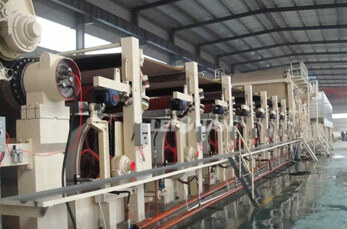 Paper tube can resist the edge indentation and bear lathe processing. Leizhan can provide the full set of paper pulp processing system and high grade paper cone making machine for paper plant to produce high grade paper cone. Use virgin pulp, waste paper as raw material to produce high quality paper cone. We can provide the full pulp processing system: Drum pulper system, Pulp cleaning system equipments, Pulp screening system equipments and Pulp refining system equipments and approach flow system for paper plant. Leizhan supplied paper cone making machine has the trimmed width range of 1575-4800mm and operating speed range of 80-200m/min, and it has the basis weight range of 350-1000 GSM with the production capacity range from 50 to 500 tons per day.